This Gold Medal Cotton Candy Machine is the real deal. 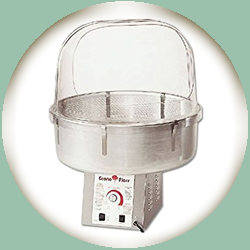 Make true carnival style cotton candy at a rate of up to 3 servings per minute. Must purchase at least 1 set of supplies per machine rental. Set of supplies is $11.99 and includes 1 carton of flavored sugar and 70 paper cones. Additional supplies may be bought for $11.99 per set. Flavors include Blue Raspberry, Bubble Gum, and Strawberry. Expected servings: With 1 carton of our floss sugar you can expect approximately 70 servings. This can vary depending on how large or small you make the servings.